Here are some photos from Avril's concerts in Houston (June 5) and St. Paul (June 10)! She's changed her onstage outfit away from the Avril Lavigne Foundation "ROCKS" tee. Avril is definitely feeling better. Send her some loving messages on Twitter to know that you are thinking about her! I'm with @AvrilLavigne now, she's not going to be able to do the show tonight. She's getting an IV right now and I will keep you posted. I'm beside her... she's really disappointed and hopes you all understand. I wouldn't normally post anything that's not Avril related, but I just started a new fan site for country music duo Florida Georgia Line. If you are a fan, visit the site (http://flagaline.net) for all up to date info, and follow us on Twitter! Avril recently talked to the Roz and Mocha Show in Toronto about her recent meet and greet criticism and how Deryck is doing. 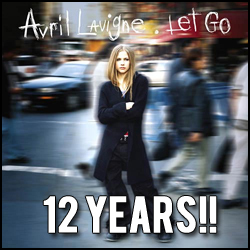 "LET GO" - 12 YEARS! Today, June 4, 2014 marks 12 YEARS that Avril Lavigne's debut album (that made the world fall in love with her attitude, style and personality), "Let Go" was released! Celebrate by listening to it today and tell me what your favorite song is! NO CANADA OR EUROPE TOUR?! According to Sharifa from AvrilBandaids who talked to Avril recently, the tour is ending next month after this US leg with Backstreet Boys. That means no Canada or European dates :( I'm so sad. Are you disappointed that you might not be able to see Avril live in a city near you? Here are some highlights from Avril's Los Angeles (May 29) and Las Vegas (May 30) shows with the Backstreet Boys! Shania Twain joined Avril backstage after her Las Vegas show last night! How cool is this that 15 years later, these two are still friends. I love this on stage look! Here are pictures of Avril last night in Mountain View, CA! It looks like she also removed Hello Kitty from the setlist, and that outfit with the HK skirt. 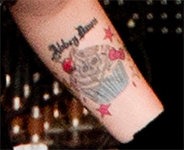 We can also finally see a clear shot of Avril's new tattoo! She covered up her skull and crossbones (that you can faintly still see) with a blue cupcake with stars! Thanks to Avril Bandaids France for the great pictures. Brand new spring/summer layout made once again by Natalie. Enjoy! Avril is nominated for "Your Fave Artist or Group" at the 2014 MuchMusic Video Awards! You can vote every day, so let's help her win!